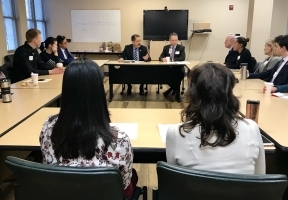 Congressman Jesús “Chuy” García held a roundtable discussion on Monday at Erie Humboldt Park Health Center to address the impact the government shutdown is having on the people of Illinois’ 4th Congressional District. 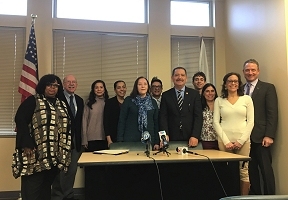 Alongside Congressman García, members of Erie Family Health Centers, Connections for Abused Women and their Children, La Casa Norte, Instituto del Progreso Latino, Chicago Metropolitan Battered Women’s Network, Mujeres Latinas en Acción and the American Federation of Government Employees (AFGE) attended the roundtable discussion. “I have heard from my constituents and from the organizations in our district that are trying to continue their work to help keep people safe, healthy and in their homes. What I heard was enormous anxiety and concern about their ability to continue providing the services that so many in our communities rely on. This government shutdown is irresponsible and harmful,” said Congressman García. According to NATCA, there are about 100,000 federal employees and federal contractors in Illinois. About 7,500 of them are furloughed or working without pay. “Erie Family Health Centers is concerned about any uncertainty the current government shutdown may cause our patients, many of whom rely on government benefits like SNAP and WIC to care for their families. While we feel fortunate that the Department of Health and Human Services is not directly impacted by the shutdown, we know that halted or delayed social service benefits can have a ripple effect on the health of our patients. Until there is a resolution, Erie will do everything we can to help support those impacted,” said Lee Francis, President & CEO of Erie Family Health Centers.